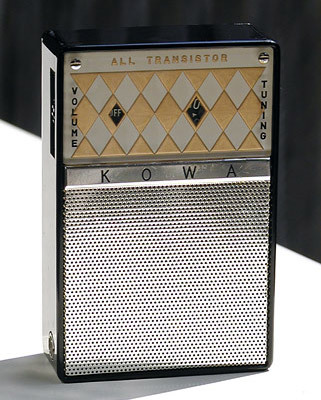 Here is another compact 3-transistor radio from 1959. A demure but charming set, this is one example where a pretty reverse-painted panel adds a great deal to the appearance. Like the 3-transistor Crown TR-333, the KT-31 came with a nice genuine pigskin carrying case.